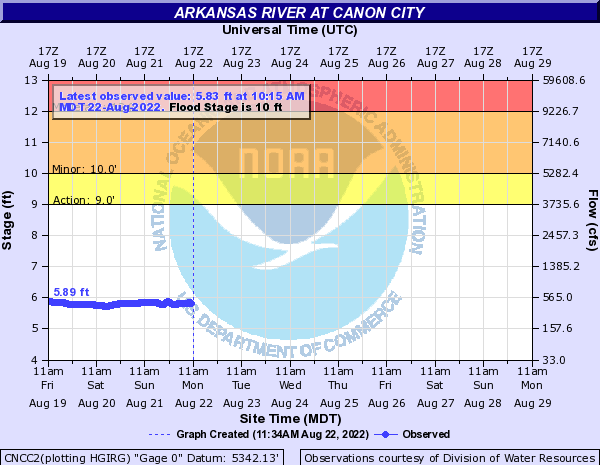 Starting just above the power plant above Centennial Park off of 2nd st. in Canon City there is a boat ramp river right with a class 3 wave. Keep river left due to pour over or put in just above 1st play park wave in Centennial Park. Next drop is 1/2 mile down stream at the Centennial Park play park holes. This is a class II drop that gets a lot of traffic from locals after flows drop. A fair surfing wave that is a bit choppy and needs flows at or above 700 cfs to do any real play boating. A class II- run for about a quarter mile and then another play wave. Other surfers have complained about some sticky/retentive qualities but the author has not seen it at the flows boated. The rest of the run is a fun float at low/moderate flows anything over 1600 cfs will scare first run boaters. This is a great second run for 12 year olds at 700 cfs that cant roll and have a great wet exit. Take out at Ash street just after bridge river right or you can continue through town and get out at McKenzie bridge a few miles down past Ash street if you don't mind a bit of a rocky climb and scramble.